These Extra-Marshmallow Rice Krispies Bars with Confetti are soft and gooey-chewy, with a tinted white chocolate glaze and fun mix of sprinkles! 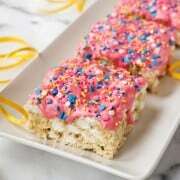 Even now, well into my 40’s, I still love a Rice Krispies bar just as much as when I was a kid. And if they’re extra marshmallow-y and super buttery, all the better. I’m always playing around with different ratios of cereal, marshmallows, and butter, but never really got serious about documenting a recipe until now. Because our youngest daughter is a super fan of Rice Krispies bars, and this was her birthday treat request this year. I dolled each square up with a white chocolate glaze, tinted pretty in pink. 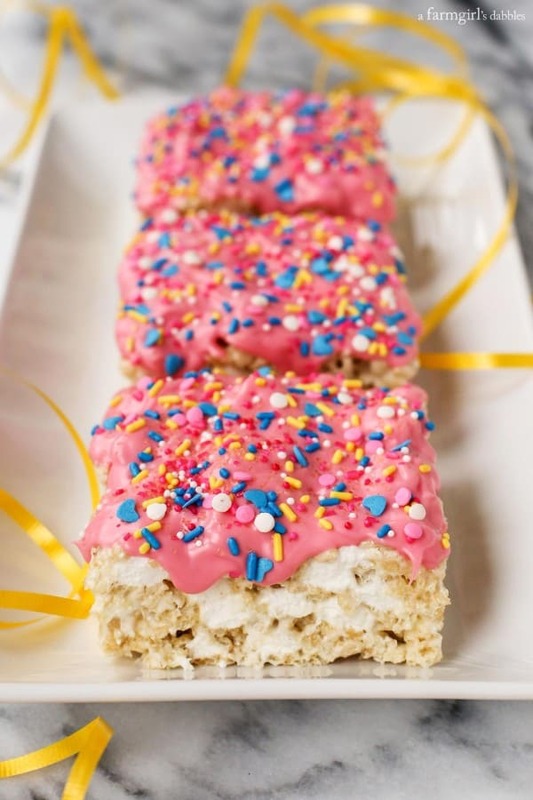 And then a custom selection of sprinkles finished off these Extra-Marshmallow Rice Krispies Bars with Confetti. What kid (young or old-er), wouldn’t love this for a special birthday treat?! Our sweet Tessa turns 9 years old tomorrow. She is pure joy. Tessa is our animal lover. If you see her nose in a book or close to an iPad screen, she’s more than likely researching animals. For the past two summers, she has been taking horsemanship/riding lessons from a super lovely local woman. She has become fast friends with our neighbor/friend, helping to walk their two dogs several times a week. 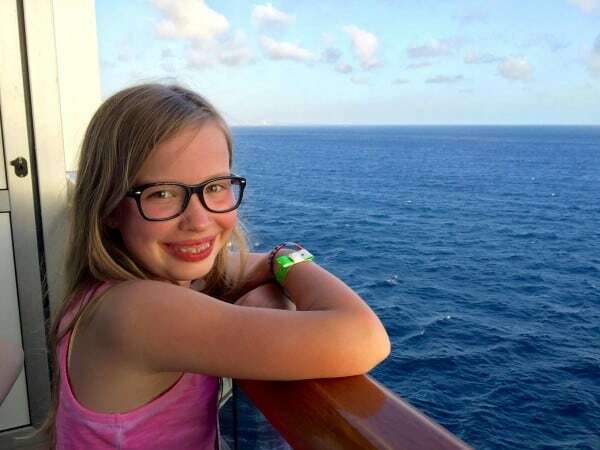 And for her 9th birthday, she is using birthday money to purchase an aquarium, fish, and all the miscellaneous necessities and accessories that go along with that. Tessa likes sweet treats, but she’s a bit pickier about what she’ll have more than a couple bites of. Rice Krispies bars have always been a big hit for her. 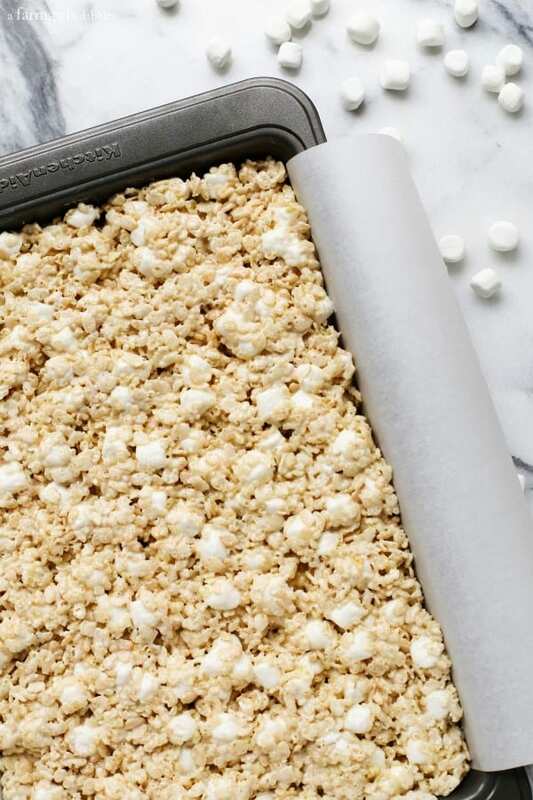 This recipe is super marshmallow-y, using considerably more marshmallows than your typical 9″ x 13″ pan of Rice Krispies bars. Two bags of marshmallows are melted with butter and mixed with the cereal. And then another whole bag is folded into the mixture, leaving big pops of whole marshmallows studded throughout. These bars are soft and gooey-chewy. I asked Tessa if she’d like to make her own custom sprinkles mix. Her eyes got big and wide as she pulled up a stool at the counter. 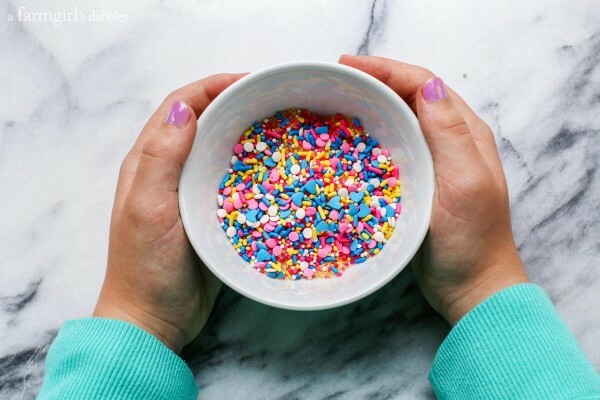 With a tub full of sprinkles, she went to town creating her own colorful mix, just as joyful and colorful as she is. 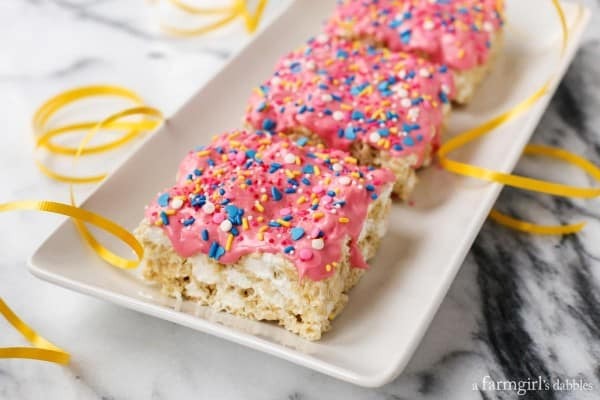 These extra-marshmallow Rice Krispies bars are so much fun to make. And, obviously, they are highly adaptable. The white chocolate could be tinted any color you choose, and the sprinkles options are endless. 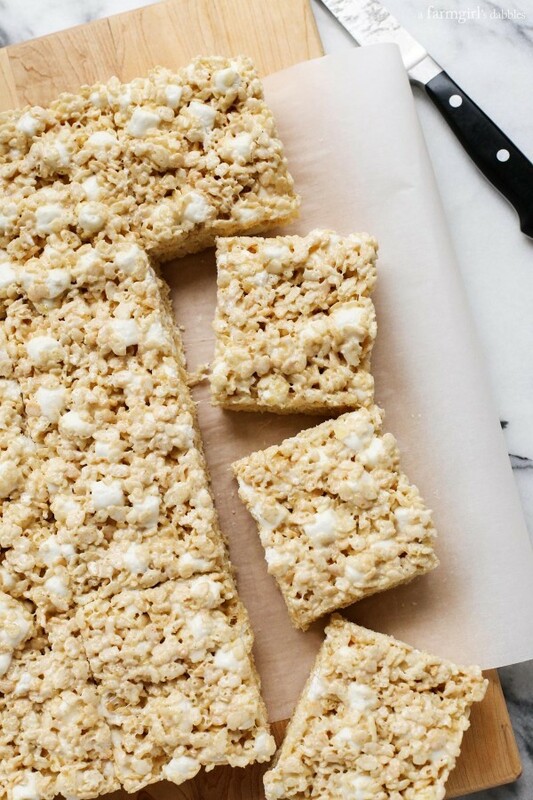 Here’s to extra soft and chewy Rice Krispies bars and celebrating the special people in our lives! Line a 9″ x 13″ pan with parchment paper, letting two opposite sides overhang the pan. Set aside. In a very large pot over medium heat, melt the butter. Add 2 of the bags of marshmallows and stir almost constantly until they are completely melted. Stir in salt. Remove from heat and pour in Rice Krispies, folding gently the whole time until all is combined. Then gently fold in final bag of marshmallows so that these marshmallows stay whole. Press mixture into the parchment paper lined pan to make a flat surface. I like to use the buttery side of the butter wrappers just used for the recipe – this helps you press in the mixture without sticking. Let cool completely. Then lift the bars out of the pan using the parchment paper overhangs. Cut into squares. In a medium microwave-safe bowl, very gently melt the white chocolate on a lower heat seating in the microwave, stirring often. Take special care to not let the chocolate scorch, or it will be ruined. You could also melt the chocolate on the stovetop using a double boiler. Once chocolate is almost all melted, just continue to stir until it is completely melted. Remove chocolate from heat. Then stir in candy coloring, to your desired color. 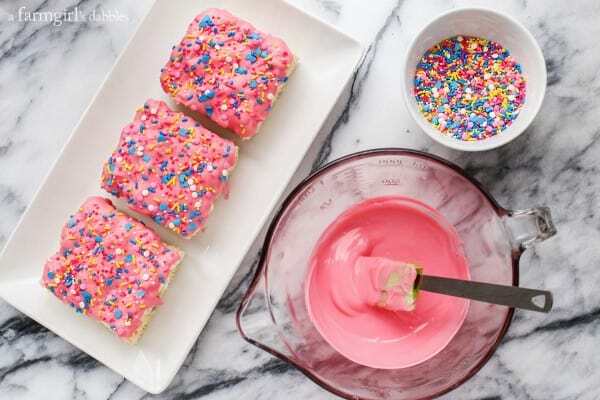 Spoon and spread the colored chocolate over a couple individual bars, and then add sprinkles while chocolate is still warm and soft. Repeat, two bars at a time, until all bars are coated. Let chocolate set completely.